One of the most beloved restaurants in Los Angles is VEGAN! Yes, you read that right. Chef Tal Ronnen is the founder and chef of Crossroads, a popular restaurant in Los Angeles serving mouthwatering Mediterranean meals to vegans, flexitarian's, omnivores and meat eaters. With no obvious vegan cues, most guests don't even make the connection that the menu is plant-based. This year, those of us who don't live in Los Angeles were given a gift: Crossroads: Extraordinary Recipes from the Restaurant That Is Reinventing Vegan Cuisine. "Reinventing plant-based eating is what Tal Ronnen is all about. At his Los Angeles restaurant, Crossroads, the menu is vegan, but there are no soybeans or bland seitan to be found. 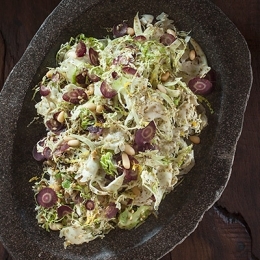 He and his executive chef, Scot Jones, turn seasonal vegetables, beans, nuts, and grains into sophisticated Mediterranean fare—think warm bowls of tomato-sauced pappardelle, plates of spicy carrot salad, and crunchy flatbreads piled high with roasted vegetables. In Crossroads, Ronnen teaches readers to make his recipes and proves that the flavors we crave are easily replicated in dishes made without animal products. With accessible, unfussy recipes, Crossroads takes plant-based eating firmly out of the realm of hippie health food and into a cuisine that fits perfectly with today’s modern palate. The recipes are photographed in sumptuous detail, and with more than 100 of them for weeknight dinners, snacks and appetizers, special occasion meals, desserts, and more, this book is an indispensable resource for healthy, mindful eaters everywhere." The Crossroads team has given us our holiday gift early and we're sharing it with you! 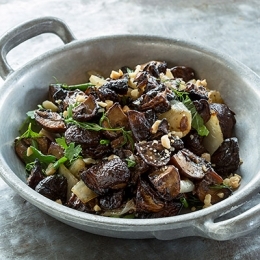 Here are three delicious recipes from the Crossroads cookbook that would make the perfect sides for your holiday table. Baby parsnips are so tender that you don’t even need to peel them. (And if you did, there wouldn’t be much vegetable left!) Parsnips have a sharp flavor reminiscent of parsley’s and become incredibly sweet when roasted. Here they are drizzled with a glaze of maple syrup, a pinch of red pepper flakes for heat, and a splash of vinegar. 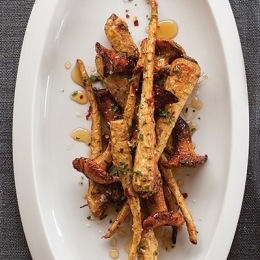 Chanterelle mushrooms don’t come cheap, but they add a woodsy flavor to this winter dish.